Is a Rational Discussion of Open Access Possible? 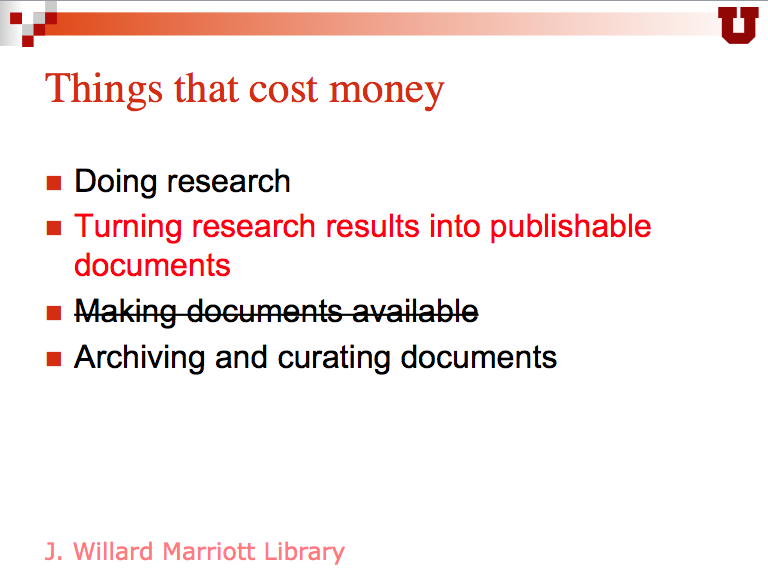 First, here’s the problem: scholarly information costs money. It costs money to create it by doing research; having done the research, it then costs money to turn the results into a publishable document; having turned the results into a publishable document, it then costs money to make the document available to the world and to keep it that way. Typically, the initial costs of doing research are borne by a combination of funding agencies and academic institutions. Traditionally, the costs of turning research results into publishable documents have been borne by a combination of academic institutions and publishers. And the costs of making the documents available to the world have been borne by publishers. Each of these three entities (funding agencies, academic institutions, and publishers) gets its money from a different pool, though there is some overlap between them: public funding agencies are supported by tax dollars; private ones have their own endowments; academic institutions are funded by a combination of tax dollars, tuition, donations, commercialization revenue, and grants; publishers are usually supported by charging readers (or readers’ agents, usually libraries) for access to the documents they publish. No one much objects to funding agencies being underwritten by tax dollars, or to universities being funded by taxes and tuition. But publishers charging for access to formally-published scholarship is increasingly controversial for two reasons — one of them economic and one of them philosophical. 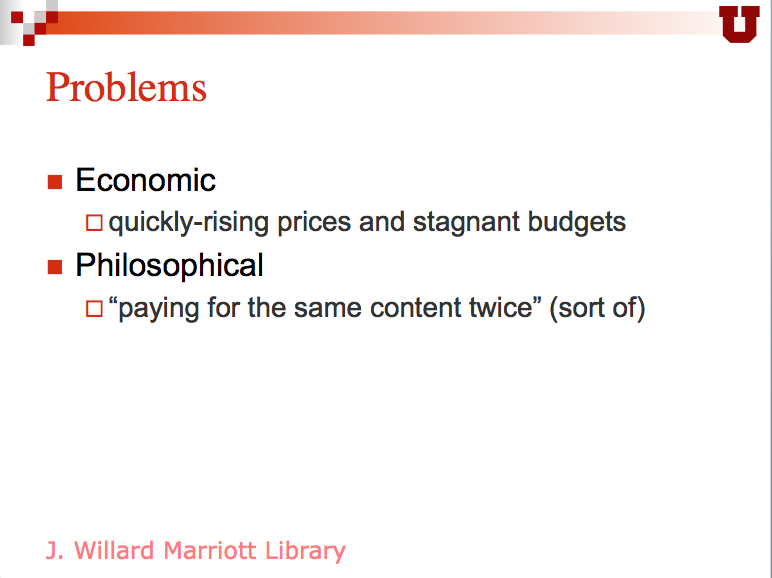 The economic consideration arises from aggressive pricing behavior on the part of many commercial scholarly publishers (and some putatively non-profit publishers as well), combined with stagnant library budgets. With journal prices generally rising at roughly four times the Consumer Price Index annually (and sometimes much more than that) and with library budgets generally flat or declining, there is a slow-motion crisis underway in the world of journal subscriptions. Regardless of one’s philosophical view of the current publishing system, the economic problem of mismatch between prices and budgets is a real and pressing one. The philosophical consideration arises largely from the vexing fact that the content being sold to libraries by publishers originates in the very institutions to which it is being sold. And not only are academic institutions producing the raw content, but they’re providing much of the peer review and editorial work as well, usually without any compensation from the publishers; academics generally consider these services to be part of their contribution to the profession, and they do the work on university time. The idea of then paying what are, in some cases, extortionate prices for access to the fruits of this work is increasingly distasteful to many on the academic side. The combination of concrete fiscal pressure and a mounting resentment towards publishers who take scholarly content out of academia and then sell it back to academia at a high price has led to the growth of the Open Access movement, which proposes to make published scholarship freely available to the world. This movement has arisen not only because the current system is fiscally unsustainable, but also from the feeling that it’s morally indefensible — that it’s simply wrong to deny people access to scholarship, especially when the public underwrote the research from which it originates. Now, let’s go back to the four-part problem I outlined a moment ago. I said that it costs money to perform research, and it costs money to turn research results into a publishable scholarly document, and it then costs money to make the document available to the world and to archive it permanently. That third statement is actually much less true than it used to be, because with the advent of the World Wide Web (and, more particularly, with the emergence of free blogging platforms) the cost of simply disseminating one’s research results is now negligible. Today, any scholar who wants to bypass the formal publication system and make her findings freely available to the whole world can do so at essentially no cost either to herself or to her readers. So if dissemination is essentially cost-free, why have traditional publishers survived? Why do scholars — who presumably want readership more than anything else, so that their ideas and discoveries can have an impact on their disciplines and bring recognition both to themselves and their institutions — why would they willingly feed their manuscripts into a system that slows down the process of dissemination and then restricts access to those papers, letting them be read only by those who can pay for the privilege or who work at institutions that pay on their behalf? One answer is that scholars don’t, in fact, typically want maximum readership above all else. Scholarly communication is about much more than just telling the world what you’ve thought and discovered. It’s also about review and certification. Telling the world that you’ve discovered a cure for cancer is easy — Google the phrase “cancer cure” and you’ll find a thousand people making just that claim. What’s harder — what scholars and scientists want, and what costs money — is the process of taking submission of those claims; weeding out the obvious nonsense; subjecting the remainder to coordinated review; editing and formatting the papers that make it through that review; and creating and maintaining a robust and well-organized archive of them. Authors want that process to exist because when their work makes it through the process, it signals to their peers that the work is solid scholarship and should be taken seriously. Any model that proposes to do some or all of these things and then give the resulting documents to readers at no charge faces a problem: it will have to get financial support from someone other than readers. I mentioned earlier that academia underwrites some parts of this process, because the editors of scholarly journals and the peer reviewers who provide first- or second-pass filtering of submissions are very often academics themselves, whose time is paid for by their host universities rather than by publishers. However, it’s also true that their contribution to the scholarly certification process only accounts for some of the work and the cost that go into that process. Substantial costs are still borne by publishers as well. So the basic challenge is this: the costs of producing scholarship have traditionally been underwritten partly by subsidies of academic time and effort, and partly by access fees paid by libraries and readers. To make the content freely available to readers threatens the viability of scholarly publishers — a few of whom are large and very profitable multinational corporations, but most of whom are nonprofit discipline-based organizations that regard publishing as a core element of their missions and depend on publishing revenue to underwrite services for their members. Open Access models vary in their responses to this challenge, which is to be expected. What is distressing is what seems to me a tendency, particularly among the most prominent voices in the OA community, to insist that discussion of these models focus exclusively on their benefits, and to discourage and punish any discussion of their costs and downsides. Let’s look at those two statements separately. First, the statement that OA models vary in their response to the cost challenge. The two broad models currently most prevalent are generally referred to as Gold and Green. Under the Gold model, articles are made freely available to the public immediately upon publication, and the publisher’s revenue stream is usually preserved either by some form of institutional subsidy or by payments exacted from authors. Under the Green model, articles are published as usual in toll-access journals; however, some version of each article (often the final peer-reviewed manuscript) is archived in a repository and made available to the general public. In many cases, an embargo period of six or twelve months is imposed on access to the deposited article in order to protect at least some of the publisher’s ability to sell access to the formally-published version. Each of these models addresses the fiscal challenges involved with providing free access in a different way. Each involves costs and benefits, and each of them entails consequences both intended and unintended. An important, positive, and intended consequence of Gold OA is free public access to high-quality scholarly information. Another important (though unintended) consequence of the Gold model lies in the fact that, since it provides for immediate free access, the publisher’s incentive to maintain a high quality of output is weakened. This isn’t to say it disappears entirely or that Gold OA journals aren’t any good — some are very good, and some aren’t (just like toll-access journals). It’s only to point out that when your business model does not rely on people buying your product, the incentive to invest in a high-quality product is relatively weak. This is a problem when the journal in question is supported by institutional subsidy — but when a Gold OA journal is funded by author payments, the incentive problem becomes far worse. In fact, with an author-pays model, the quality incentives move from weak to actively perverse. If your revenue increases with a higher rate of acceptance, then there’s a strong incentive to accept papers without regard to quality. The implications of this perverse incentive are serious, and are playing out in what has come to be called the problem of “predatory publishing.” Another downside to the author-pays version of Gold OA lies in the fact that authors don’t typically pay these fees themselves, but instead very often write them into research grant proposals. This means that funds are directed away from the support of new research and towards the free dissemination of prior research results. 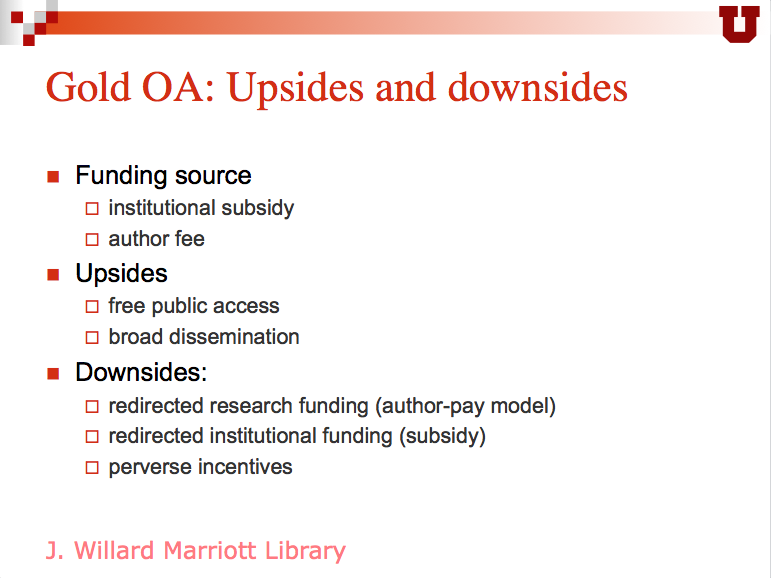 When OA journals are supported by institutional subventions, then the problem is one of opportunity cost — what can’t the organization do because it’s supporting an OA journal? An important, positive, and intended consequence of Green OA is free public access to high-quality scholarship. An important (and at least partly unintended) consequence of this model is that it undermines the ability of publishers to recoup the investments they make in selecting and preparing articles for publication and in maintaining an ongoing archive of them afterwards. In the case of this model, the perverse incentive lies not with publishers, but with those who encourage and facilitate the model itself. Green OA relies on publishers to continue adding value to raw manuscripts, but by making the resulting articles available for free it reduces the incentive to pay for them; this threatens to put publishers out of business and thus to undermine the Green OA model. The only way Green OA can succeed in the long run is if it works poorly — if the versions available for free are substantially inferior to the versions available at a cost, or if they’re out of date or hard to find. If the model works so well that it results in universal, easy, immediate, and comprehensive access to high-quality articles at no cost, the incentive to pay for access disappears completely — and so do the publishers on whom the model depends. What I’ve tried to do up to this point is lay out, as accurately and fairly as I can, the issues that have given rise to the OA movement, the dynamics that currently prevail, and both the positive and negative implications of those dynamics. I hope that from my presentation so far it’s been clear that OA offers both very real benefits and advantages, and very real costs and disadvantages. It has always seemed to me that the costs, benefits, merits, challenges, implications, and consequences of any dissemination model can (and should) be assessed and analyzed with some degree of dispassion and objectivity. This brings us to the second statement I made a moment ago — the one about an unwillingness in the OA advocacy community to discuss (or even countenance discussion of) these issues in that way. I realize that’s a strong statement, and it carries with it an obligation not only to provide examples, but to make sure that the examples I provide are truly representative and not just cherry-picked outliers that misrepresent or exaggerate the problem. Because I recognize that obligation, I’m going to make the text of this lecture available online with links to the examples I provide so that readers can assess their fairness for themselves and arrive at their own conclusions as to my trustworthiness as a messenger and the seriousness of the problem I’m presenting. (That’s also why I’m reading the text here, which is not how I normally deliver talks.) The text and slides will be posted on a blog that I’ve established for this purpose. Comments will be open, and I’ll respond as best I can. 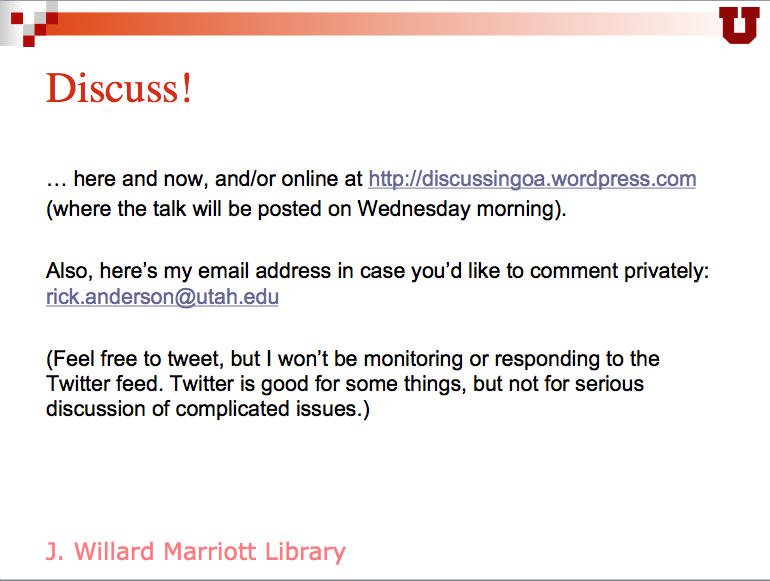 Some are going to be tempted to dismiss what I say on this topic out of hand, because I write for the Scholarly Kitchen, a professional blog where scholarly communication issues (including OA) are discussed in a critical mode, and which is often characterized by OA advocates as an anti-OA forum. This is an unfortunate but common response, and it illustrates the problem I’m going to describe. For example, recently I published a posting in the Scholarly Kitchen that pointed out some serious problems with ROARMAP, an influential registry of institutional OA policies. Here’s one response from an OA advocate. Notice how, instead of addressing the pervasive errors and misinformation I documented in my posting, it simply asserts ROARMAP’s wonderfulness and attacks the Scholarly Kitchen for talking about ROARMAP’s problems. This is only one tweet, of course, but similar reactions from others are documented in the comments section of the posting. This is not rational discussion; it’s an attempt to avoid it. Here’s another, from the blog of one very prominent and influential OA advocate. 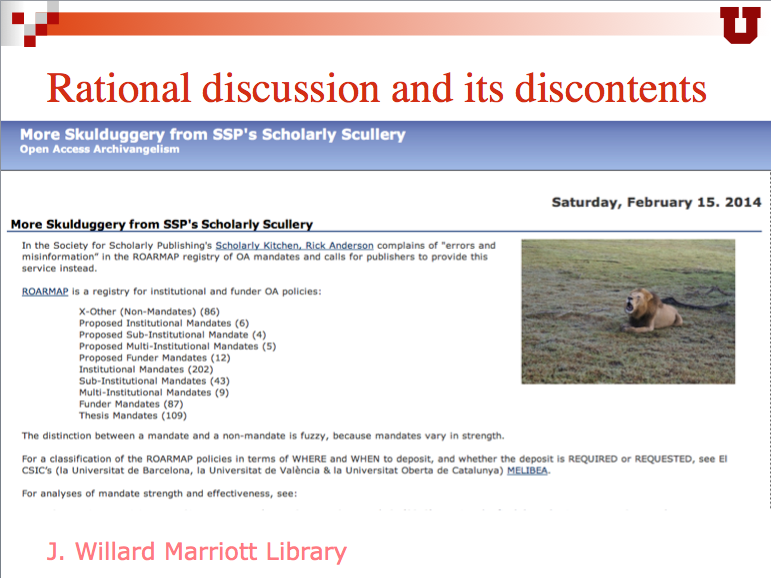 Notice the insinuation of sinister motives and the name-calling — my posting constituted “skulduggery,” the blog is referred to as “the Scholarly Scullery,” etc. 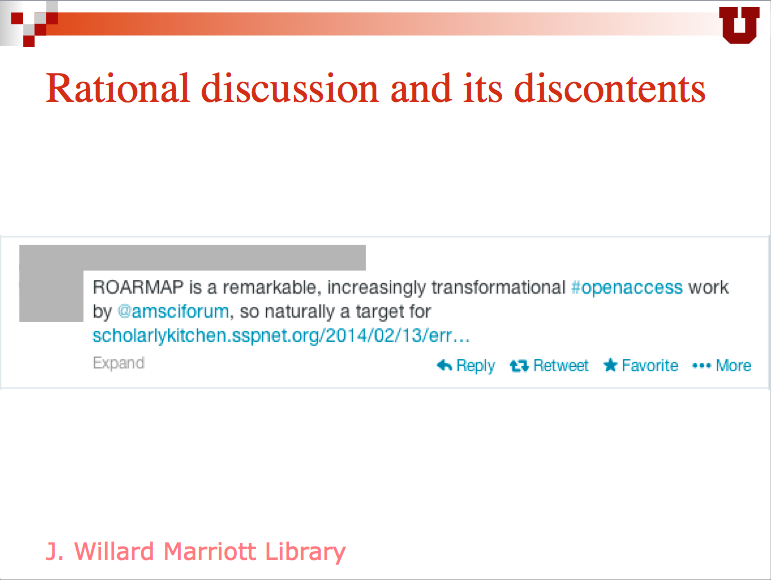 The ROARMAP site itself also provides an example of the dynamic I’m describing: instead of accurately and objectively presenting data about institutional OA policies, it presents them inaccurately and in a manner that seems clearly designed to exaggerate those aspects of the policies that the site’s owners find most congenial. (Again, I’ll provide links both to ROARMAP and to my discussion of its problems so that those interested can judge for themselves.) Nor is ROARMAP the only such example: the MELIBEA registry, based in Barcelona, is, if anything, less accurate and more tendentious than ROARMAP in its presentation of OA policies, as I showed in the subsequent discussion in the Scholarly Kitchen. Much of the controversy about these registries arises from the strange insistence, on the part of some prominent members of the OA community, on referring to all OA policies as “mandates,” even if they have nothing mandatory about them. The only reason I can think of for that insistence is a propagandistic one — though I’m certainly open to other ideas about what gives rise to it. I actually asked a couple of the people responsible for ROARMAP why the systematic exaggeration is necessary. One chose not to respond because I write for the Scholarly Kitchen. The other responded by simply repeating (at great length) the assertion that all OA policies should be called “mandates” regardless of whether they’re mandatory, and by darkly speculating about whose interests I was trying to serve by raising the issue. (See, again, the comments section of my Scholarly Kitchen posting on ROARMAP.) Again, this is not rational discussion; it’s an attempt to shout down and discredit the messenger. 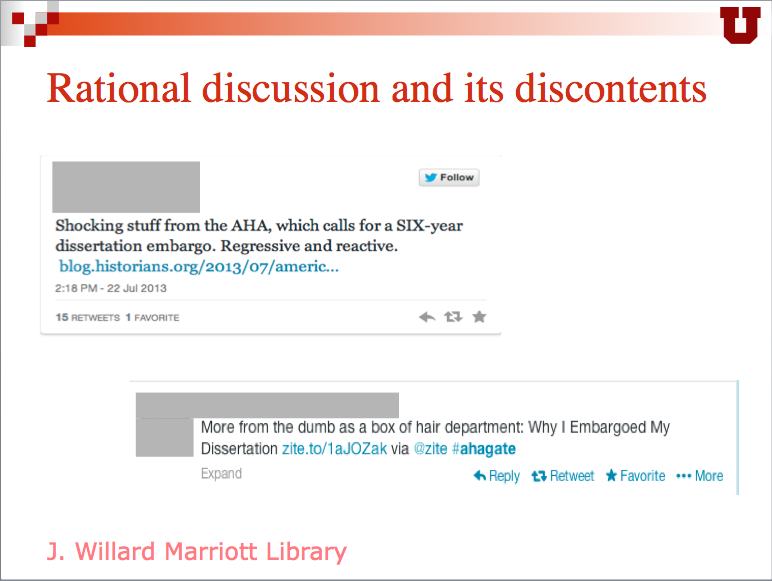 Another example: when the American Historical Association called on institutions to allow graduate students to embargo their dissertations for up to six years (instead of the three typically allowed now), this was characterized by OA supporters as “shocking” and “regressive” and as retrograde and paternalistic; in one case, a scholar who spoke out in favor of the AHA’s position was publicly characterized as “dumb as a box of hair.” Fair enough; this is the Internet, after all, and there’s nothing wrong with expressing your opinion. What undermines rational discourse, though, is when you criticize a statement that you have not made a good-faith attempt to understand or even to read. 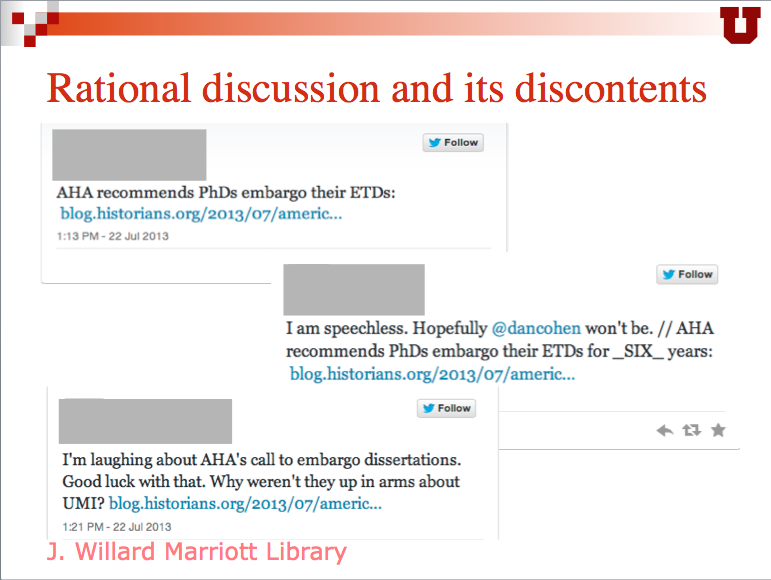 In this case, many of the AHA’s harshest critics seem actually not to have read the statement, since a good number of them characterized it as a call for embargoes, which it wasn’t — it was a call for authors to be allowed to embargo their dissertations for a longer period if they so choose. One critic who did read the statement and saw how uncontroversial its actual content was, chose, therefore, to criticize the statement’s “subtext” instead of its text — or, in other words, to take it to task for things it didn’t say but which the critic was sure it really meant. It doesn’t seem to me that name-calling, misrepresentation, and mind-reading are examples of rational discussion. Instead, they are attempts to avoid and derail it. The most egregious example of this kind of reaction, however, came in response to science journalist John Bohannon’s study of editorial practices at several hundred OA journals. He orchestrated a sting operation, whereby he submitted a putatively scholarly paper (which was actually nonsense) to 304 author-pays OA journals, just over half of which accepted it for publication. His finding reflects the perverse incentive I mentioned earlier — a journal that makes its money by accepting papers rather than by selling access to high-quality content has a natural incentive to accept low-quality papers. Instead of acknowledging this problem and expressing concern over the degree to which it is reflected in the fraudulent practices of quite a few OA journals — practices that Bohannon demonstrated conclusively — the OA community generally responded by attacking Bohannon. (See, for example, here, here, and [especially] here; the DOAJ’s response, in which it accused Bohannon of racism, has apparently been taken down. In contrast to these, prominent OA advocate Peter Suber’s analysis, though critical on balance, struck me as admirably honest and even-handed.) Now to be clear, Bohannon’s investigation wasn’t perfect and there are legitimate criticisms to be made of it; what is not in question, though, is that he uncovered a very serious problem among this population of OA journals. What this all means, I believe, is that OA’s growth and progress are being hampered by a “shoot the messenger” culture that inhibits the OA community’s ability to deal with real issues and challenges. The only challenges that are allowed to be discussed are those related to how best to spread the word of OA, how to implement OA programs, and how to achieve maximum adoption of OA policies. Challenges and problems that arise from OA itself are not to be discussed; attempts to discuss them are punished. This is not a call for rational discourse; it’s a call for magical thinking. I have seen estimates of OA’s penetration of scholarly publishing ranging from 2.5% of articles (under Gold and hybrid models) to 20% (under Gold and Green combined), but even at the top end it’s quite clear that toll-access models remain very much the norm in scholarly publishing. Pretending otherwise might be inspiring, but it also undermines our ability to talk in useful and realistic ways about the challenges that exist in the real world. More perniciously, it also erodes our motivation to address real problems created by OA initiatives; after all, if the war is already won, what’s the point of raising concerns or pointing out problems? What about OA opponents? Are they more willing to discuss these matters in a reasonable way? In fairness, I obviously have to address this question. The problem is, I can hardly think of anyone who, to my knowledge, actually opposes OA (other than, perhaps, Jeffrey Beall, who has done excellent work on the problem of predatory publishing but whose recent article attacking the OA movement was, in my view, unbalanced, inaccurate, and unfair). Even my fellow chefs in the Scholarly Kitchen — despite the way we are regularly characterized in the OA blogosphere — are not generally opposed to it; several of us, in fact (including myself) are actively involved in supporting OA programs. In my experience, what gets a person characterized as an enemy is not necessarily actual opposition to OA, but rather any public suggestion that OA entails problems and costs as well as benefits. What we need is an environment in which it’s possible for all stakeholders to speak openly, candidly, and rationally about the pros and cons, the costs and benefits, of all publishing models — not without fear of contradiction, but without being shamed, silenced, or accused of bad faith simply for raising important and troublesome issues. When discussing OA we have to be able to talk about both its benefits and its costs, because when we insist on talking only about benefits, we’re not engaging in analysis; we are engaging in advocacy. Advocacy has its place, but its limitations should be obvious: it’s in the nature of advocacy to try to quash any suggestion that the thing for which one is advocating produces anything other than benefits. This seriously limits the advocate’s ability to deal in a reasonable and effective way with real-world problems. The irony here is that when we push analysis aside in favor of advocacy, we end up shooting ourselves in the foot. Advocacy is actively counterproductive if it means punishing people for raising real issues and problems. You can only ignore reality for so long before it finally wins. To be clear, none of this is to say that anyone should stop advocating for OA. By all means, advocate away. What I do hope is that those who do so will refrain from demonizing, misrepresenting, and silencing those who try to discuss OA in a spirit of critical analysis. I should point out here that not everyone working for Open Access is trying to silence dissenters and doubters. But the voices trying to discourage discussion and debate, and to shame anyone who raises concerns, are loud and public, and I’d be much less concerned about that if I saw more prominent figures in the movement standing up publicly in favor of open debate and critical analysis. There are lots of voices in the OA community calling on us to fall into line, to join the movement, to accept that either resistance is futile or victory is inevitable (depending on your perspective). I wish I heard more voices inviting us to raise concerns, to help identify and resolve issues, to anticipate problems. I wish I saw the embrace of dissent that most of us in libraries would, in any other context, consider to be an essential aspect of intellectual engagement. Some skeptics are willing to raise their voices even if by doing so they run the risk of being put on an enemies list. But others have decided that keeping their heads down is the better and safer path. The sad thing is that the OA community would almost certainly benefit, in the long run, from listening to what the critics and questioners have to say. Acknowledge that all models have pros and cons. Any discussion that proceeds from the assumption that Open Access (or toll access, or any other model of scholarly communication) has only upsides or only downsides is a discussion that will not be honest and is highly unlikely to go in productive directions. Even a system that produces universal access to scholarship is going to have downsides that impact dimensions of scholarship other than access. Here’s a thought experiment that each of us can undertake in the privacy of our own minds: think of your favorite access model. Maybe you’re a for-profit publisher and subscription revenues are essential to your business; maybe you’re an OA advocate and your ideal scenario is 100% Green OA with no embargoes. Ask yourself this question: “If my ideal solution were universally adopted, what would be the downsides for scholarship?” If you can’t think of any, then one of two things is true: either your preferred model is perfect, or you’re not examining your model fairly. Comprehend, then respond. Too often, productive conversation is derailed because one or more of the participants is responding not to what was said, but to some distortion or misrepresentation of what was said. Each of us can be careful to avoid that mistake and can quickly take responsibility when we do make it. 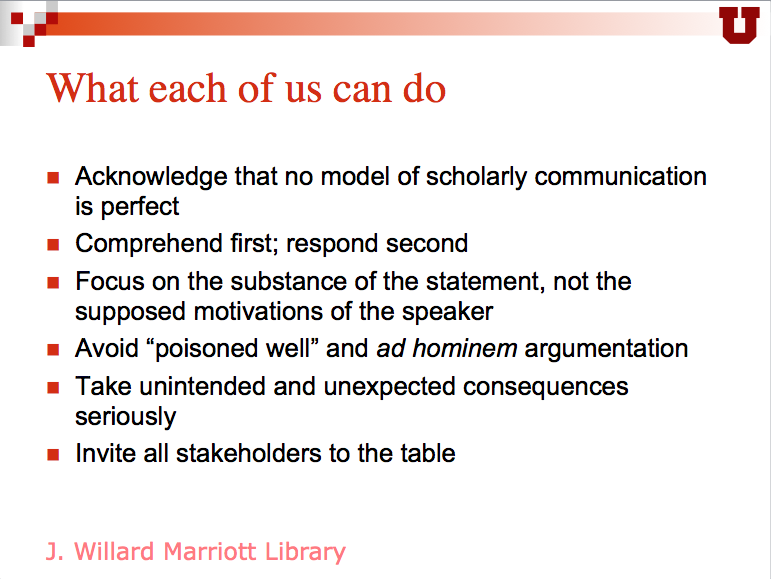 Avoid “poisoned well” and ad hominem arguments. This is related to the question of motivation, but it’s not quite the same thing. “Poisoned well” and ad hominem arguments say “no matter what that guy says, we shouldn’t listen because he’s a bad person or believes in Bad Thing X.” Anytime you hear someone using this line of argument, chances are good that he’s afraid of what will happen if you look closely at the issue in question, and so is trying to shift your focus away from the issue and towards the defects of the person raising it. None of us should engage in this kind of argumentation. Take unintended and unexpected consequences seriously. No matter what initiative you undertake — a new toll-access journal, an Open Access policy, an institutional repository, a change to copyright law — some of the consequences of your initiative will be ones you intend and wish for, and others will be unexpected and undesired. One of the dangers of advocacy is that it carries with it an incentive to discount the unintended and the unexpected and to focus on the intended and the expected. Advocacy leads us to focus on convenient truths and to either deny or downplay inconvenient ones. Again, this is not to say that there’s no place for advocacy in the conversation about OA — only that we need to be aware of its limitations as a frame for useful and responsible discussion. Moderation and inclusiveness are unpopular notions in many segments of our society today, and nowhere more so, I believe, than in the scholarly-communication wars. The problem is that when we’re dealing with complex problems involving many stakeholders, needs that are in tension with each other, and inevitable tradeoffs, moderation and inclusiveness are essential to a rational and productive discussion. In order to make comments visible at the top level of the blog, I’ve had to turn the original posting into a page. That means I also have to recreate the two comments received so far, so here they are. For anyone who wants to see my initial response, as tweeted while watching the talk, most of it is in this thread. But, Rick, I take your point that responding on, or to, Twitter is often a fool’s errand, so I’ll write a proper response in the next few days. Advocates should accept that serious, critical discussion of OA shows that the “movement” has made progress. Discussions about implementation are necessarily more critical than early stage advocacy. thanks, really well-balanced and helpful analysis — good candidate for where to point people for an overview on these issues! 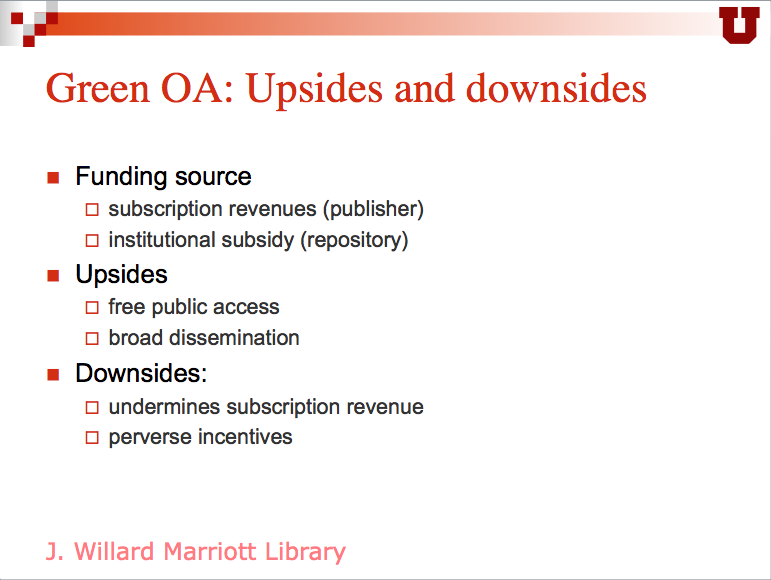 There was one point I’d suggest could be restated more neutrally: “The only way Green OA can succeed in the long run is if it works poorly.” I know this is claimed by some, on the argument that conventional publishers are essential to the model, and would be put out of business eventually. However, others such as Stephan Harnad argue there are viable outcomes in which these publishers are replaced, or at least their functions unbundled and partly or completely fulfilled by other mechanisms. For example, Priem and Hemminger ’s “Decoupled journal” model (paper: http://dx.doi.org/10.3389/fncom.2012.00019). Turning to your larger point about enabling “rational discussion,” this is an excellent goal and key point, and I’d have to agree, I’ve seen a lot of disappointingly tendentious, propagandizing, or unrigorous arguments in this area. It might be said that this is not so different than most other complex discussions, and, to paraphrase Kant, out of the crooked timber of humanity no straight argument was ever made. However, I’ve come to think that Open Access discussion is a particularly interesting laboratory and test case, for the wider problem of how to achieve rational discussion and responsible advocacy. It’s a complex and contested issue (“wicked problem”) that involves all areas of science and scholarship, as well as political and commercial sectors. How do or might people from scientific and scholarly backgrounds — whom we might hope to have particular expertise in or inclination towards reasoned discussion — engage in this? What’s especially interesting to me is how we might design deliberative and publishing processes to better achieve such goals, perhaps starting with this issue but considering also wider scholarly, general, and Web publishing. The 2009-10 Scholarly Publishing Roundtable you described is one model. More generally, I wonder how to build forums which incent and enjoin those of different views to iteratively engage, refactor, refine, and evidence their arguments. This is in some ways the opposite of prevailing models of debate and publishing, which center on independent voices in contention, in an open field, which a reader or audience must try to integrate and sort out. (I wrote more about this in: “Collaborative Argumentation and Advocacy,” June 2013, http://tjm.org/2013/06/01/collaborative-argumentation-and-advocacy/). It seems like around open access we should have open thinking, but how? Perhaps, ironically, bounding discussion — in the sense of making it more engaged and collaborative — is an answer. Thanks very much for these thoughtful remarks, Tim. As for the point about Green OA’s impact on publishers: it seems to me that the terms “put out of business,” “replaced,” and “unbundled and partly or completely fulfilled by other mechanisms” are pretty synonymous. But I should be clear that I’m perfectly willing to entertain arguments for putting publishers out of business — as long as the person making the argument makes it honestly and is willing to acknowledge its implications. What I have less patience with is those who try to stop the discussion when those implications start coming up. I think your idea of collaborative argumentation is intriguing. If you have a potential proposal in mind for a programmatic application of it in this context, I’d be very interested to hear about it (offline might be easier, but here if you prefer). Just a small correction: You are misrepresenting my post. I did not attack Bohannon. If anything, I attacked Science Magazine (read the title: “How embarrassing was the ‘journal sting’ for Science Magazine?”) for publishing this anecdote when they just a few months earlier refused to publish actual data on this very topic, but in which they did not fare equally well. In the post you linked to, I used analogies to reiterate that point when the story kept reverberating, after I (and many others, some of which you linked to) had already written earlier about why Bohannon’s piece was never worth publishing to begin with. What is irrational about using analogies to criticize a supposedly scholarly journal for publishing flawed news stories but rejecting actual data? Isn’t this the opposite of what scholarly journals ought to do? Yes, this is precisely in question! For one, most of ‘this section’ is about as relevant to OA as NIgerian bank scams are to banking. Actually, the opposite outcome would have been more newsworthy! Second, without a TA group, the whole slant towards OA journals is so obviously unjustified, that nevertheless shoehorning it into that direction evinces either incompetence or malice/fraud. But there have been many incompetent or malicious/fraudulent authors in Science Magazine, so I don’t attack the authors, I attack the journal that perpetuates this incompetence and malice/fraud. And according to Hanlon’s Razor, I shouldn’t even presuppose malice or fraud, but incompetence. Thus, to sum tings up: I cannot find much rationality in a rational treatment of the numbers Bohannon reported in his news piece: the rational, scientific reaction is to dismiss it, not to engage it. Rationally engaging these numbers would be like rationally engaging the number of days a magic man needed to create the universe. You are misrepresenting my post. I did not attack Bohannon. Referring to Bohannon’s study as an “entirely meaningless stunt” and an “embarrassingly inane project” certainly looks to me like an attack on Bohannon. This doesn’t mean that you aren’t attacking Science as well — clearly you are. But the characterizations I just quoted are of the work that Bohannon himself undertook. Yes, this is precisely in question! For one, most of ‘this section’ is about as relevant to OA as NIgerian bank scams are to banking. Here is a classic example of what I believe is misleading argumentation that undermines our ability to discuss OA rationally. I say that Bohannon’s sting demonstrated “a very serious problem among this population of OA journals.” You then respond as if I had said that he had demonstrated a very serious problem with OA itself, rather than with one particular population of journals operating under one particular model of OA. You’re not responding to what I said, but rather to a straw man. You’re misquoting me again: I wrote “the outcome of this stunt is entirely meaningless” – you cannot use these numbers for anything. One quote you do get right: it was an embarrassingly inane project, which is just the conclusions of the criticisms I didn’t repeat, because they’re in the linked posts. So again, I did not attack Bohannon: I explained the scientific, rational reasons why one should not take his newspiece seriously and then referred to it with the fitting moniker: an embarrassingly inane project. What did I say about him? Where did I attack him and not his work? Neither in the linked post, nor in the previous one did I attack him: I always attacked his piece in Science Magazine and Science Magazine themselves for publishing it. In your post and in your reply, you consistently misrepresent what I write and misquote me (deliberately? ), and at the same time you wonder why people do not discuss rationally? Misrepresentation, lies, exploitation, double speak, lobbying and other shenanigans is all we scientists ever get from publishers, and you wonder why some of us have given up on any rational discourse with publishers? I think you have just demonstrated one major reason right here in your post and your reply to my comment. To be completely frank, if I may, most of what is coming from publishers comes across as almost an insult to our intelligence. Your references to my post here is also of the sort where I start to ask myself if maybe you might deliberately have misrepresented it, assuming I am too intellectually challenged to realize it, so that perhaps you might get away with it. This is precisely the suspicion I have also developed over the last 15 years or so observing how some publishers act and what they say. And I must admit: after such a long time of being insulted over and over again, it is hard to remain rational in this process all of the time. I was actually addressing both points simultaneously in condensed form (admittedly perhaps not very eloquently): this section of OA journals was expected to accept everything and only people who send money to Nigeria wouldn’t realize this. Hence, the moniker ‘OA’ isn’t relevant, nor is it a serious problem for anybody with this section of journals. If you re-read this again in this way, I hope you can see that I attempted to address both points: that it neither is a problem with this section of journals (a), nor with OA in general (b), precisely because of point (a). So again, no, I was challenging you on precisely your point and I am doing it again here: these journals never posed any sort of problem, neither for OA nor for anybody else and therefore Bohannon’s numbers do not add anything at all to any of the topics he or you aim to address. One quote you do get right: it was an embarrassingly inane project, which is just the conclusions of the criticisms I didn’t repeat, because they’re in the linked posts. As far as I can see, the phrase “embarrassingly inane” isn’t used in any of the posts to which you link in the blog entry to which I referred in my lecture text and from which I quoted above. Nor is that phrase set off in quotes in your blog entry. These are very clearly presented as your own words, and your own assessment of Bohannon’s work. Your posting does not offer any “scientific, rational reason why one should not take his newspiece seriously,” nor is there anything scientific or evidence-based in that posting. It’s a brief and emotional rant, and a fine example of the kind of rhetoric that I believe (for the reasons laid out in my lecture) is ultimately doing more damage than good to the cause of OA. The same goes for sentences like “Misrepresentation, lies, exploitation, double speak, lobbying and other shenanigans is all we scientists ever get from publishers, and you wonder why some of us have given up on any rational discourse with publishers?” Apart from its hyperbolic misrepresentation of publisher behavior, the question it poses is a straw man — I don’t wonder at all why some people have given up on rational discourse with publishers. You’ve made your reasons very clear. What I’m saying is that giving up on rational discourse harms your cause. As for your assertion about the meaninglessness of Bohannon’s findings, the facts are these: Bohannon uncovered more than 150 OA journals that claim to offer legitimate review-and-certification services to scholarly authors, but in fact take their authors’ money and provide none of those services in return. While I agree with you that this finding does not indict OA in general, it does very clearly indicate a problem with the author-pays model, which is much more prevalent in OA than in toll-access publishing. To say that Bohannon’s finding is meaningless because any intelligent person would know that these publishers are all scam artists is like saying that it’s meaningless to tell people a building is full of cobras because everybody knows cobras are dangerous. When faced with Bohannon’s findings, a much smarter way for the OA advocacy community to respond would have been to say something along the lines of “Yes, we know that there is a significant population of journals being published on a scam basis under the banner of OA. This is troubling and we’re working on figuring out what to do about it. (And by the way, here are some problems and weaknesses in the structure of Bohannon’s study. )” Instead, by immediately going into attack mode, the OA community has given the impression that it can’t bear critical examination. Of course it does: just follow the first link in the posting. As I wrote, this post only added some analogies to what everybody else and I had already written. That I agree – but it is not an attack on Bohannon as you claimed originally. It’s an attack on his newspiece and Science Magazine. Importnalty, the rant came two days after the rational, scientific dismissal of this newspiece went seemingly without much effect. In fact, it aimed to mock not only Bohannon’s work and Science Magazine, but also those who actually took the numbers seriously and helped perpetuate the nonsense by disregarding the flawed nature of the piece. English is only my third language, but is it really “hyperbolic misrepresentation” if I can document every word I used? Huh? The cobras are the analogy of scam publishers and the house is the analogy for scholarly publishing? Then please allow me to correct your analogy: nobody in our position ever goes to the basement of that building as there is nothing for us to do there. Even if someone ever feels compelled to go there anyway, there are warning signs for cobras all around and the snakes are clearly visible. Thus, if someone goes there anyway, I think the problem lies with the person, not the building or its inhabitants. It may be much smarter, but it would also be a double lie – at least if I said it. Neither is it a significant population, nor would any OA advocate ever bother with scam journals, just like no banker would ever try to go after Nigerian scammers. In my experience, such a tactic would maybe fit into the behavior pattern of corporate publishers, but I would find such lies deeply unethical. Of course it does: just follow the first link in the posting. True enough: although the posting that I referenced does not provide such a response, one of the links it contains does lead to another that provides more in the way of a rational response. I agree [that it’s a brief and emotional rant] – but it is not an attack on Bohannon as you claimed originally. It’s an attack on his newspiece and Science Magazine. It is an attack specifically on Bohannon’s work, which I am characterizing as an attack on Bohannon. I stand by that characterization, and I think most reasonable observers would agree. If you want to disagree that the two are equivalent, then of course you’re free to do so. Importnalty, the rant came two days after the rational, scientific dismissal of this newspiece went seemingly without much effect. Have you considered the possibility that it “went… without much effect” because your argument wasn’t compelling? You think my publisher characterization above is “hyperbolic misrepresentation”? […] English is only my third language, but is it really “hyperbolic misrepresentation” if I can document every word I used? It most certainly is. Not because publishers as a group are innocent of bad behavior (I regularly criticize publisher misbehavior myself), but because anyone with any experience of publishers will know that in addition to the bad behaviors you cite, many of them also provide rigorous review, honest dealing, fair pricing, and valuable services both to their journal customers and to the scholars they serve as membership organizations. What makes your characterization irresponsible hyperbole is the phrase “all we scientists ever get.” The problem here isn’t with your command of English, but with your faulty logic (the presence of bad behavior = the absence of good behavior) and irresponsible exaggeration. Please allow me to correct your analogy: nobody in our position ever goes to the basement of that building as there is nothing for us to do there. This is demonstrably untrue. Scholarly authors submit articles to these scam journals all the time. That’s why they exist, and it’s how they make their money. If it weren’t for people like Jeffrey Beall and John Bohannon risking lawsuits and the wrath of the OA community for shining light on them, these scam artists would be even more successful than they are now. Neither is it a significant population, nor would any OA advocate ever bother with scam journals, just like no banker would ever try to go after Nigerian scammers. How many scam journals would there have to be before you considered them to represent a “significant population”? And if OA advocates feel that catching and exposing scam OA journals is beneath them, but are also going to punish those who do undertake that project, then can a reasonable observer come to any conclusion other than that OA advocates are just fine with letting scam journals flourish, as long as they’re OA? Let me make sure I didn’t misunderstand you: in your view, the right thing would have been to pretend the numbers are worth discussing, even though they are not, then pretend they constitute a problem, which they don’t, then promise to find ways to solve a problem that does not exist. And now you’re telling me that one main reason for why we should lie like this, is because if we state the methodological fact that the numbers are useless, we are attacking Bohannon and attacking persons is a bad thing and counterproductive? I’m sorry, but that is advice I’d rather not take, as it is in deep conflict with my memory: If I would lie so much, I would have quickly forgotten which lie I’ve used where. I’m afraid my memory isn’t nearly good enough for the kind of rational strategy you propose. I’m sure your strategy would pay off, looking at how politicians make careers and the kind of money publishers are raking in, but I’m afraid I’m just not biologically well-endowed enough to keep track of all my lies this strategy would necessitate. But maybe this was not what you were trying to say? The other authors and I weren’t arguing: we stated the methodological fact that collected the way they were, the numbers are useless. Or are you trying to imply that because creationists still exist, biologists don’t have compelling arguments? Or are you trying to say that you cannot see the difference between an argument and a fact? None of the section of the scholarly community you mention include research scientists (intentionally or my accident?). Personally, I have never in my life seen a publisher provide rigorous review (we do that for them for free), I have never experienced honest dealing (I don’t deal with them, my library does), none of the prices I’ve seen anywhere are fair (not even any of the gold OA APCs I could cite off the top of my head (there may be some, but I’d have to check), nor have I seen valuable services that couldn’t be had with more functionality for less cost almost anywhere else. So I can only take your word that these few white sheep actually exist, but none of their actions or words ever make it to my screen or that of my colleagues. You might be correct that my section of the scholarly community ever only gets the bad news and that certain big, bad players are ruining the reputation for all the others. To that I say: tough luck, get your business in order, provide us with reasonable infrastructure that suits our needs for a reasonable price and we’ll be quiet. Where I sit, that’s not even on the horizon. To conclude this aspect: our direct interactions with publishers are usually horrible from start (an hour before submission just to enter all your co-authors into an online form?) to finish (dysfunctional ‘paper’ without most of the basic online functionalities we’ve come to expect from all other online documents), even when you don’t consider all the access problems (there are mostly illegal, but well-working, albeit tedious workarounds) and the news we get is that legacy publishers spend part of the money they get from us trying to prevent that it will ever get any better. That’s the researcher perspective and from that the above isn’t hyperbole. Please show me the ścam journals with more than a handful of papers. And if there are such scam journals, please show me those where the people who have papers in these journals also have papers in non-scam journals. I have yet to find any, but I admit I did not do an exhaustive search. If there are such journals, I’ll reverse my position and say that indeed, smart people really do fall for such journals. You say the problem exists and I’d like to see any evidence for such a problem. If they published more than 0.1% of the cited scholarly literature annually. Can a reasonable observer come to any conclusion other than that banks are just fine with letting scammers flourish as long as they take their victims’ money? I’ll call Bohannon a hero if he travels to the countries where the scam journals sit and shuts them down one by one, just as I’d love the Nigerian police to take care of their scammers down there. In your view, the right thing would have been to pretend the numbers are worth discussing, even though they are not, then pretend they constitute a problem, which they don’t, then promise to find ways to solve a problem that does not exist. But the numbers aren’t useless, and they are worth discussing. Over 150 OA journals accepted Bohannon’s nonsensical paper for publication. That’s a meaningful result, and it illustrates a real problem with the author-pays model. Personally, I have never in my life seen a publisher provide rigorous review (we do that for them for free), I have never experienced honest dealing (I don’t deal with them, my library does), none of the prices I’ve seen anywhere are fair (not even any of the gold OA APCs I could cite off the top of my head (there may be some, but I’d have to check), nor have I seen valuable services that couldn’t be had with more functionality for less cost almost anywhere else. Then by all means, take it from someone who has been dealing with scholarly publishers for over 20 years and knows what he’s talking about: the majority of them are honest and are doing their best to provide good value for the services they render. Most of them are non-profit scholarly and professional organizations who exist to serve their members. You may agree or disagree that they do a good job, but to say that they give the scholarly community nothing but “misrepresentation, lies, exploitation, double speak, lobbying and other shenanigans” is to betray a deep ignorance of what most of them actually do. Please show me the ścam journals with more than a handful of papers. To the degree that the Nigerian scammers you keep referring to are actually pretending to be banks (rather than pretending to be deposed princes, heiresses, etc. ), and if the Nigerian banking community is ignoring that fact and getting angry whenever anyone points out the problem, then yes, that’s the conclusion I think a reasonable observer would come to. Confirming that the sky is still blue doesn’t win anybody any brownie points in OA-advocate land and using a flawed methodology in the process disqualifies anybody in scientist land, where people are generally less dismissive of replications or confirmed hypotheses. So if that actually was an honest attempt at “undertake that project” of “catching and exposing scam OA journals”, that noble intent was buried deep under a pile of propaganda and incompetence. I think it’s interesting that this whole comment thread arose because you took exception with my characterization of your blog posting as an “attack” on Bohannon. In light of what you’ve just written here, do you still want to stand by that objection? Or are you ready to just own the attack? Is this one of your “rational” tactics? You can’t really be serious after all that has been written and said? Too bad I can’t see your face. Are you teasing me or have you not understood anything at all? Hanlon’s razor demands I assume incompetence before assuming malice, but understanding the very basic methodological facts and their implications do not require the brain of an Einstein and have been pointed out numerous times by many authors, some of whom you cite, including me. Hence, I am faced with deciding if the above is either outright malicious provocation, or the abject failure or refusal to grasp even the simplest of methodological concepts. Neither case makes any further explanations on this issue seem particularly worthwhile. How did you come to that conclusion? I skimmed some of the papers published there, where I thought I had at least a vague chance of being competent enough to make a reasonable judgment and these few papers seemed ok to me. Some of them were addressing rather local issues, many in developing countries, but in terms of phrasing the issue, methodology and presentation of results, these didn’t raise any red flags. Granted, they may all be plagiarized, I didn’t check for that. this doesn’t strike me as a particular problem with these journals or their business models, but rather more of a general issue. So why do you think these are scammy? Being on Beall’s list used to be a pretty decent indicator in my books, until his meltdown when he lost all credibility. At first, admittedly cursory glance, these seem ok to me. What is it they are supposed to exemplify the problem of? What did I miss? Where should I have looked instead? Are you being serious or is this one of your “rational” tactics again? Are you trying to tell me that you cannot see a difference between my posts on my site and what I wrote here? The difference between my replies to your assertions and what I wrote concerning the newspiece and Science Magazine’s publication policies is, if at all possible, even simpler to grasp than the basic methodological flaws in Bohannon’s work. If you seriously claim that you fail to understand any of the two very simple circumstances, I fear I really have completely wasted my time here. Again, I can’t decide from here if you are provoking me or really lack certain abilities. In the first case, I won’t play along, and in the second case, someone with more patience, training and expertise in special ed would be much better suited than me. (Journal X) — Apart from the syntactic weirdness of the journal title itself (never a good sign), open up any paper at random (I looked at several) and you’ll find that the writing is rife with basic grammatical and syntactic errors, suggesting that editorial oversight is lax at best. (Journal X) — Of the four, this one raises the fewest substantive red flags. But the impression of scamminess comes from its suspiciously generic title, and its website’s look-and-feel, and the fact that it’s published by the “Academic Research Publishing Agency.” Furthermore, although the journal’s postal address is in Pakistan its publisher’s American address appears to be an apartment building in Berkeley. Its advertised approach to “starting a new journal” seems suspiciously lax. (On the other hand, this one is admirably up-front about its APCs.) None of this is dispositive, of course; it just feels off. I freely admit that the impression of “scamminess” I’m getting from these journals may be wrong. Again, I invite anyone interested to check them out and arrive at their own conclusions. Indeed, this is my last comment here. It is interesting, perhaps telling, that you looked at the cover and I looked at the content to determine the ‘scamminess’ of these journals. Indeed, the cover looks suspicious, I agree, but the content seems, again, at very brief and superficial glance, legit. There are plenty of examples, where the opposite can be shown. Which would be worse: journals that look legit, but contain more than the average share of unreliable, even shoddy science (like the so-called ‘top’ journals have been shown) or journals that look suspicious, but contain legit science (like the ones you linked to may seem like)? So I think that venue will cease to have any relevance at all. After all, it’s only in our heads. It is interesting, perhaps telling, that you looked at the cover and I looked at the content to determine the ‘scamminess’ of these journals. No, I looked at both, as I explained. In some cases the content was more obviously weak than in others. Which would be worse: journals that look legit, but contain more than the average share of unreliable, even shoddy science (like the so-called ‘top’ journals have been shown) or journals that look suspicious, but contain legit science (like the ones you linked to may seem like)? If a journal looks suspicious on the surface but is in fact characterized by high-quality science, then there is no substantive problem. If it’s a “so-called ‘top’ journal” that accepts garbage for publication (as has happened recently with journals published by Springer and IEEE), then the publisher should be caught and publicly called out. The publisher should acknowledge its errors, apologize to the scholarly community it has failed to serve, and move immediately to fix the problems. What it should not do is attack the messenger who exposes the problem. This applies to all publishers, whether toll-access or Open Access. And if there are such scam journals, please show me those where the people who have papers in these journals also have papers in non-scam journals. I have yet to find any, but I admit I did not do an exhaustive search. If there are such journals, I’ll reverse my position and say that indeed, smart people really do fall for such journals. Anyway, because I feel uncomfortable with publicly identifying as “scammy” the titles I originally provided in response to Bjorn, and because I don’t want to hide the fact that I made a weaker argument earlier, I’ve edited their names and websites out of the comments above and replaced all of them with “Journal X” (just to maintain the syntactic coherence of the comments). I feel much less concern about so characterizing those journals that accepted Bohannon’s paper. Exactly. So here we have hundreds of OA publishers essentially defrauding authors and then presenting garbage to the world as scholarship, and the OA community’s response is resolutely, even aggressively, to ignore them. This strikes many observers (myself included) as more than a little disturbing. They’re nothing to do with us: they just stole the name. The analogy with banks and and Nigerian 419 scams is apposite. We’ve got work to do. Not to harp on this, but that’s not true. These publishers haven’t stolen the name of OA. They’re not pretending to be OA publishers — they truly are OA publishers. The name they have stolen is that of scholarly publisher. But since they carry on their fraudulent business under the banner of OA, those who draw attention to the problem get attacked by the OA community. This does not reflect well on the OA movement. Sorry, Rick, I’m not having it. You’re trying to make other people’s bad behaviour our problem; and it just isn’t. I’ll leave it to Rick to decide how much is worth bringing over to this page. Thanks for this, John. When I clicked through I think I saw you continuing to edit the document in real time — is the version I see now the final one? Yes. I realised I was offering a CC-BY license to your content and felt the need to correct that misstep. Thanks, John. I’ve just finished responding to your comments and invite you and all other interested readers to take a look. There are too many to bring into this commenting string, but I hope people will click through and see what you’ve said — your comments were thoughtful and constructive. Thanks very much for making them. I commend Jim’s essay to anyone interested in this topic — partly because it’s well-reasoned and civil, and partly because it’s important for all of us engaged in this debate to remember to invite working scholars themselves into the discussion. Some of us are working scholars, of course, but many of us aren’t, and too many of us in the latter category assume (erroneously) that we know what scholars want and need, or (also erroneously) that we know better than scholars do what they ought to want and need. If you’re going to bash my blog post as “mind-reading” (your bashing being done in a rational manner, of course), you might as well put my name in the text and not rely on people to follow your links. I could use the notoriety. Brian, I’m sorry if the term “mind-reading” seemed like “bashing” to you. To me it seems like a fair characterization of what you did in that posting, which was to take the AHA statement to task not for what it said, but for what you were certain it really meant. Criticizing people’s “subtexts” strikes me as a fundamentally unfair mode of argument. If you re-read my post, you’ll note that I’m calling out not the statement but a subsequent post by a former AHA president that labeled tenure-track faculty (at institutions where the book is the primary consideration for tenure) as “our most vulnerable colleagues.” Is this type of exaggeration (given the much more precarious situation of adjunct faculty and wide range of colleges and universities where this situation would not apply, this is a significant exaggeration) a “fair” mode of argument? I’m not actually griping with your characterization of my use of subtext. I used it and didn’t put it in scare quotes. I want you to acknowledge that those in positions of power (like well-known, former AHA presidents) also fail to meet the standards of rational discussions. I don’t think you should be the decider of what’s fair or not in debate, but if you are going to judge, you could at least attempt to judge both sides. My posting actually references several examples of people in positions of power failing to meet the standards of rational discourse. Whether Cronon’s defense of the AHA statement counts as an example of that is something I’ll have to judge after reading it — I just clicked through to it and it’s very long (which is perhaps not a good sign; then again, my lecture is pretty long too). But I will read it and I’ll report back on whether I agree with you that it’s irrational. As I implied, I don’t care about your judgement on other people’s tones, so you don’t need to follow up. However, in the future, when choosing examples for your writing, make sure you fully understand the context in which the examples were produced. Otherwise, it’s sloppy analysis. But Brian, I think I’ve shown pretty clearly that I did understand. You objected to my characterizing your rhetoric as “mind-reading,” so I showed why I had characterized it that way (because you criticized the AHA statement for saying things it didn’t say). Then you said you weren’t “calling out… the AHA statement” at all, but rather Cronon’s defense of it. So I showed that your text clearly refers to the AHA statement’s subtext as an “outrage.” Then you said you just wanted me to acknowledge that people in positions of power can be irrational. I pointed out that some of the people whose rhetoric I had characterized as “irrational” are, in fact, people in positions of power. Now you’re back to saying I didn’t understand your posting. If I got it wrong I’m happy to accept responsibility for that, but so far it looks like I understood it fine. What did I get wrong about your critique of the AHA statement? Thank you for your excellent thoughts on this important though highly politicised topic. Since I live in Burundi, Africa, thoughts about OA from this part of the world are somewhat different> As there is so little to read OA seems a godsend, and that is a dimension not often considered in the better off northern hemisphere. 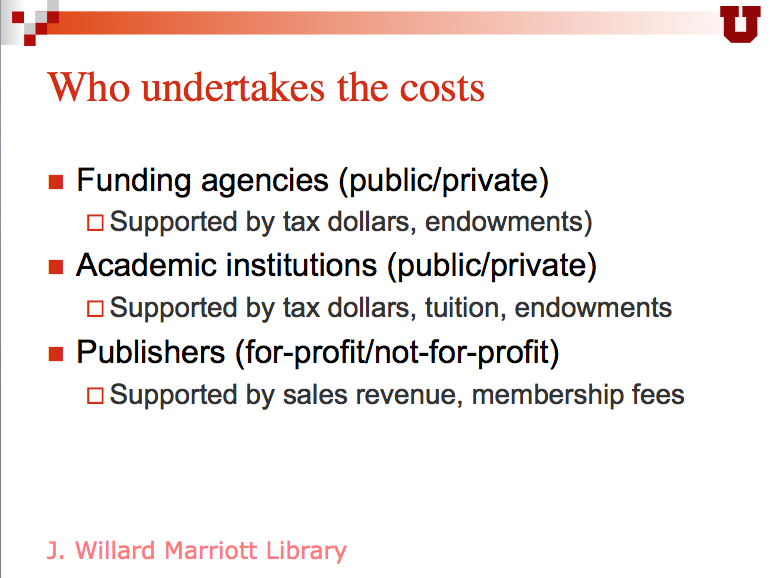 Plans by universities and research funders to pay the costs of Open Access Publishing (“Gold OA”) are premature. Funds are short; 80% of journals (including virtually all the top journals) are still subscription-based, tying up the potential funds to pay for Gold OA; the asking price for Gold OA is still high; and there is concern that paying to publish may inflate acceptance rates and lower quality standards. What is needed now is for universities and funders to mandate OA self-archiving (of authors’ final peer-reviewed drafts, immediately upon acceptance for publication) (“Green OA”). 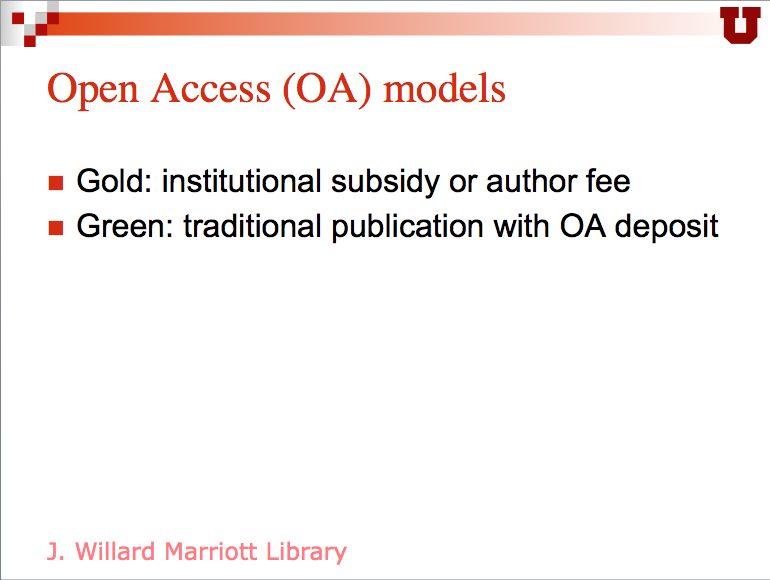 That will provide immediate OA; and if and when universal Green OA should go on to make subscriptions unsustainable (because users are satisfied with just the Green OA versions) that will in turn induce journals to cut costs (print edition, online edition, access-provision, archiving), downsize to just providing the service of peer review, and convert to the Gold OA cost-recovery model; meanwhile, the subscription cancellations will have released the funds to pay these residual service costs. The natural way to charge for the service of peer review then will be on a “no-fault basis,” with the author’s institution or funder paying for each round of refereeing, regardless of outcome (acceptance, revision/re-refereeing, or rejection). This will minimize cost while protecting against inflated acceptance rates and decline in quality standards. Green OA mandates have a much tougher road in the US than in smaller countries, where public higher education is generally administered at the national rather than the state level. At this point, there are hardly any OA mandates in the US; instead, there is a growing number of policies that express an institutional preference for OA but require no faculty members to actually make their work available that way, and it’s hard to see that changing anytime soon — the tradition of academic freedom (which is commonly understood to include the right to do what one wishes with one’s academic work) simply militates too much against it. Funder mandates do exist at the national level, of course, and I wouldn’t be surprised to see them continue to spread. But I have a very hard time imagining them ever becoming mandates for immediate OA. Publishers have been able to make pretty compelling arguments in favor of embargoes and I suspect that those arguments will continue to prevail — in significant part because so many publishers are nonprofit scholarly and professional organizations. For the antidote to publisher embargoes on immediate Green OA, see the Immediate-Deposit Mandate and the Almost-OA Button. Interesting piece. It seems that a rational discussion about open access is indeed the way forward. I’m not so sure that rational discussion isn’t there, though I accept that it may not always be very visible in the foreground. In that light, a ‘reasonable’ discussion may simply not what it will ever look like. Though I think that there is much more reason in it than meets the eye. Unfortunately, the arguments put forward are seldom divorced from the underlying motives. Those motives can, and do, range from very noble ones to strongly self-serving ones. The nature of the motives influences the way arguments are presented. And invented. But is separating the arguments from the motive with which they are put forward really possible? Perhaps not. Examples of that difficulty are the “downsides” mentioned in Rick’s piece, in particular the so-called “perverse incentives”. One perverse incentive, presented as associated with ‘gold’ open access, is this: “If [a publisher’s] revenue increases with a higher rate of acceptance, then there’s a strong incentive to accept papers without regard to quality.” This is not the case: historically, revenue increased with publishing more papers (incl. as a consequence of lowering rejection rates) in the toll access model as much as it now does in the ‘gold’ open access model. This is moderated in the toll access model by the possible risks to subscriptions (though the BigDeal arrangements attenuate that risk), and in the ‘gold’ open access model by the reluctance of authors to submit their articles to a low quality journal. In both models, this hasn’t prevented the existence of very low quality journals with a very low rejection rate (leaving aside that rejection rate can be a very poor indicator of quality). The perverse incentives, such as they are, are associated with academic publishing per se, and not with either toll access or ‘gold’ open access models. Another perverse incentive in the system — as a result of the way funding and career decisions are taken — is to publish as many articles as possible, hence ‘salami-slicing’. This, too, is independent from open access or toll-access, though it is more likely that the need to pay for APCs acts as a break on excessive salami-slicing than does the traditional subscription system. It is very clear that formal publishing costs money, and that is accepted by all but perhaps a few outliers in the discussion. The success of ‘gold’ OA publishers shows that quite a few researchers (and their funders) are prepared to pay good money for the services that amount to the formal peer-reviewed publication of their works. We mustn’t forget that ‘publishing’ means ‘to make public’ and that apart from the free availability of published research results, the main fundamental thing that separates OA and toll-access publishing advocates is the way that publishing is financed. In both cases, though, it’s largely by the scientific community itself, and so it could be argued that both systems “take money out of the research effort itself”. No difference between toll-access and open access systems here, except that open access, APC-funded systems may eventually prove that proportionally less money is taken out of the research effort, simply due to the potential of introducing true competition and the concomitant availability of choices to the party that pays the bill: authors instead of librarians. 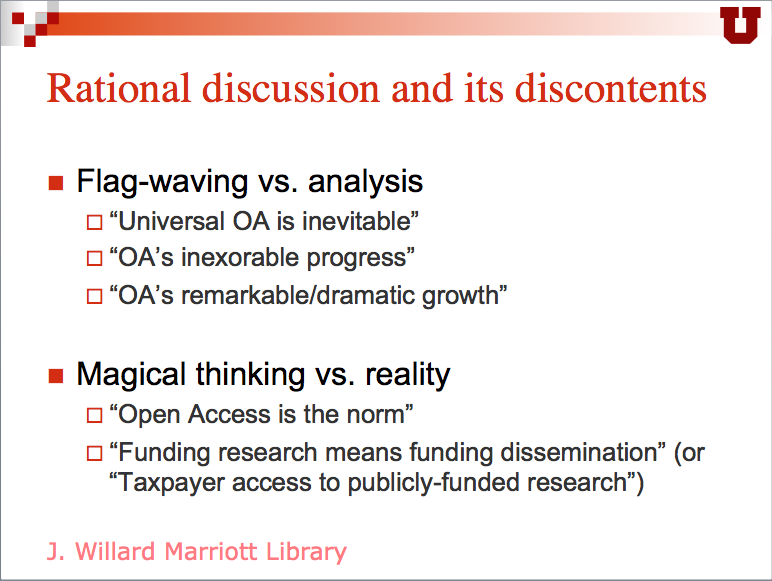 Talk of the ‘inevitability’, the ‘inexorable rise’, of open access is much less likely to be ‘flag waving’ than Rick assumes. In spite of ‘mandates’ (if they are mandates indeed), the power of OA advocates to do more than just pointing out the possibilities, and to actually be able to accelerate the take-up of open access is a perception not based on reality. Similarly, the power of traditional publishers to slow it down or even stop it is also not based on reality. This is because open access is to a large degree part of the ‘zeitgeist’ and of a much wider social, cultural, and — most importantly — technical development. The fundamental change that the web brought to the publishing environment is grossly underestimated, in my view. King Canute would have admitted that even he wouldn’t be able to stop the tide. So the question becomes not one of promoting or stopping the tide, but one of surviving it, even thriving on it. Much of open access advocacy and open access initiatives is trying to ride the waves that come with the rising internet tide. Are there no problems with an APC-funded open access model then? Of course there are. Even though the total amount of money spent on published scholarly literature may be less in an open access environment, the load of the costs will change. Institutions that do a logv of research in a relatively narrow field, and therefore subscribe to a relatively low number of journals (think CERN, for instance), will face a higher bill. Institutions that have more of a focus on teaching and especially if they do that in a wide variety of subject areas, and do a relatively modest amount of research, will find their bill reduced. My proposed approach is to look at these things on a scale larger than individual institutions, for instance on a national or State-wide scale. The effect of inequities of the distribution of costs is likely to be smoothed out substantially. Another problem is that APCs are typically charged per article published, and that loads the entire cost of a publishing operation on the published content, disadvantaging in the process those journals that are more selective relative to the ones that are less so. This is, by the way, a problem open access publishing shares with subscription-based models, which also load the cost purely on the published material (that’s what you pay the subscription for). The subscription rate or APC being commensurate with a journal’s selectivity is a distant, and probably wholly unworkable prospect. Instead, in my view solutions must be sought in levying non-refundable submission charges, similar to exam fee, which you pay regardless of whether you pass the exam. This is inherent fairer in a logical sense, probably, but it won’t be seen as such in a psycho-logical sense, I’m afraid. A ‘tragedy of the commons’ type situation. One perverse incentive, presented as associated with ‘gold’ open access, is this: “If [a publisher’s] revenue increases with a higher rate of acceptance, then there’s a strong incentive to accept papers without regard to quality.” This is not the case: historically, revenue increased with publishing more papers (incl. as a consequence of lowering rejection rates) in the toll access model as much as it now does in the ‘gold’ open access model. Not quite. Under an author-pays model, revenue rises immediately and in exact proportion to the number of articles accepted. The same isn’t true in a toll-access model, where prices may or may not be raised as the volume of content increases, depending on the publisher’s expectation of demand elasticity. Publishers of high-demand journals (or who, like the American Chemical Society, are in a position to require subscriptions in order for academic departments to get certification) can raise prices with more impunity than others, but the connection between revenue and number of articles published is much less direct than it is under an APC model. In fact, pressure also exists in the other direction: as long as a journal publisher continues to charge, say, $500 for a subscription, there is an incentive to keep the number of published articles (and thus in-house costs) down and the rejection rate (and thus the journal’s prestige) high. We mustn’t forget that ‘publishing’ means ‘to make public’ and that apart from the free availability of published research results, the main fundamental thing that separates OA and toll-access publishing advocates is the way that publishing is financed. In both cases, though, it’s largely by the scientific community itself, and so it could be argued that both systems “take money out of the research effort itself”. Of course, but it does matter where in “the scientific community” the money comes from. When cancer researchers write APCs into their grant proposals, that shifts money away from research. The same is not true when a library spends part of its collections budget on a subscription to a toll-access journal. None of this is to say that APC models are “bad” and that toll-access models are “good” — it’s only to say that we need to be honest and up-front about the costs and benefits of any model. Rick, I don’t think I’ve said or implied that APC-supported open access and subscription-supported toll access models have the same linearly proportional way of increasing revenue by publishing more. However, in general it is certainly the case that publishing more in either model is likely to result in more revenue. So the incentive is the same. It is no more perverse in one case than it is in the other, albeit that the relationship between additional amount published and additional revenue is different in each case. As for the money for publication taken out of the funds for the research itself, you must be familiar with the widespread practice of ‘overheads’ charged by institutions on grants that their research groups secure. Some of those overheads are used for the library budget, is my understanding. And part of the library budget is for the cost of serial aquisitions. Thus, it seems evident to me that grant money, in one way or another, is spent on scholarly publications, and so ‘taken out of’ research funds. It would be interesting to see if funding bodies take a look at these overheads in the light of their need to pay for APCs, and somehow make sure that the total amount ‘taken out of research’ isn’t changed, and if it is, changed (i.e. decreased) to the benefit of the research effort. The appearance on the scene of low cost publication services such as PeerJ is interesting, as the amounts involved for APCs are smaller, for an individual author, than the cost of attending even a local conference, and therefore fall in the category of ‘support for doing research and staying in touch with colleagues’, such as travel, telephone, and other communication costs. Research in splendid isolation is rarely a good thing, after all, and within reason, communication with colleagues will always be seen as a legitimate and necessary cost of doing research, I expect. When costs for publication are limited to an order of magnitude lower than what the APC charges of larger publishers (and their average revenues per article in subscription journals) amount to, the argument that APCs ‘take money from research’ is becoming very weak indeed. Spurious, even. I completely agree with the need to be honest and up-front about costs and benefits of any model. That is one of the reasons why I think that the argument of the “tax payer pays, so the tax payer mast have open access” is quite nonsensical and the result of ill-advised nationalism. The consequence would – in absurdum, but still – be that anybody’s access should be only to results of research carried out in their own country, and that a cure for a nasty disease developed in, say, Switzerland would only be freely known to the Swiss, that knowledge only being accessible for a high price in the USA and elsewhere. Thinking in those terms betrays a deep misunderstanding of how science works and of how strongly interdependent and global current science is. I don’t think I’ve said or implied that APC-supported open access and subscription-supported toll access models have the same linearly proportional way of increasing revenue by publishing more. Well, your exact words were “historically, revenue increased with publishing more papers […] in the toll access model as much as it now does in the ‘gold’ open access model.” (Emphasis mine.) That’s what I was responding to. However, in general it is certainly the case that publishing more in either model is likely to result in more revenue. So the incentive is the same. As for the money for publication taken out of the funds for the research itself, you must be familiar with the widespread practice of ‘overheads’ charged by institutions on grants that their research groups secure. Some of those overheads are used for the library budget, is my understanding. That’s correct, actually, and you’re right that it too represents a redirection of research funding and a genuine cost. It’s not my position that redirecting research funding to libraries is good and that redirecting it to APCs is bad. It’s my position that we need to be honest and up-front about the redirection of research funding. In my direct experience, open discussion of such redirection is strongly discouraged in the OA advocacy community, and that’s what I consider a problem. When costs for publication are limited to an order of magnitude lower than what the APC charges of larger publishers (and their average revenues per article in subscription journals) amount to, the argument that APCs ‘take money from research’ is becoming very weak indeed. Spurious, even. I think that the argument of the “tax payer pays, so the tax payer mast have open access” is quite nonsensical and the result of ill-advised nationalism. Predatory OA journals are problematic, and a ‘buyer beware’ is certainly called for. Scams are bad, full stop. However, some examples that have been presented by Geoffrey Beall were so egregiously ridiculous, that authors being fooled by them frankly don’t deserve to be taken seriously. The trouble is that if one includes these ridiculous examples, the legitimate warning against predatory journals is itself easily made subject to ridicule. Screaming “FIRE” when somebody lights a cigarette. The ‘buyer beware’ applies to OA as well as to subscription journals. It seems to be widely ignored for the lowest quality subscription journals, though, given that many still exist and are being sold on subscription, and honestly, that puzzles me. How honest and up-front can a discussion be if the flaws of OA journals are meted out and the same or similar flaws of subscription journals are ignored (such as in the Bohannon article)? On the issue of the cost of publishing and the funds taken out of research itself, the first thing to say is that the cost of publishing, as well as the cost of travel and attendance at conferences, is a legitimate cost of research, as without it, research is severely limited. If not published, it is as if it never took place. If not presented and discussed at conferences and ’embedded’ in a framework of other researchers’ work beyond just citations and references, it risks being a lone, isolated, unconnected piece of work. But the amounts involved do matter. If they are reasonable, the fact that these costs reduce the costs of the research itself are made good by the benefits to the research of these activities. So yes, some money is always ‘taken away’ from research by the publishing process, but that is not limited to open access. Instead, it is a characteristic of the need to publish, in whatever model, in peer-reviewed literature. One could argue that the profit levels attained by subscription journals take out far more from the aggregate actual research funds than do APCs. Could that change? Could APC-funded publishing outfits eventually achieve the same profit levels? Possibly, but far less likely, as there is at least a potential for a true market mechanism, which is lacking in the monopoloid subscription model. If you need certain articles, there is no way you can make do with cheaper ones; if you need to submit your article to be published, you do have a choice, and go to PeerJ rather than a high-APC hybrid journal, for instance. Yes, small APC charges and subscription fees would be relieving the burden on the cost of scientific research. For APCs there is a potential mechanism to reduce them; for subscriptions such mechanism isn’t there. And if it is there, it’s only to a very small degree and ineffectual. Publishers typically don’t sell more subscriptions if they lower the fees. They often do sell more subscriptions if they increase the volume of a journal, which seems to be helping to improve its impact factor and its perceived importance, plausibly increasing the faculty pressure on librarians to subscribe or at least not to cancel. If subscription fees were “all negligibly low, they too would not be worth worrying about” would only mean that the open access trend did not have the financial argument it brings to bear now. That doesn’t mean that the more fundamental reasons to argue for open access would never have emerged. I have for a long time argued that the financial and tax payer arguments should only be secondary ones anyway. Open communication is in the nature of science. Before the Web, the practical possibilities just weren’t there. Now that the Web is a ubiquitous and stable infrastructure, the possibilities of open access do exist. Nature is bound to take it’s scientific course as a result. If perceived quality were indeed a major factor in library subscription sales (and I’m sure your library is an exception, and it is an important factor there), why are the very large numbers of journals without an impact factor or with a minute one still in existence? In many cases, it’s because they’re protected in Big Deals. In other cases, it’s because the days are long gone when we selected journal subscriptions based on metrics like IF. Because of the ongoing budget-and-pricing crisis, I think it’s safe to say that the great majority of us (and certainly all the research libraries where I’ve worked) now select and keep individual journals based on demand and usage, not because we think they’re high-quality journals. We don’t initiate a new subscription unless a faculty member tells us it’s needed, and faculty need is typically determined at least as much by relevance as by perceived quality. (A mediocre journal in a high-relevancy field is likely to be more useful than a top-notch journal in an irrelevant field.) And since money for new subscriptions can only come from cancellations, we generally retain individual subscriptions only if usage data justifies it. It’s demand and usage, not objective quality, that tend to drive our subscription behavior. My library is no exception to this dynamic; in fact, I suspect that we exemplify it. Predatory OA journals are problematic, and a ‘buyer beware’ is certainly called for. Scams are bad, full stop. [snip] How honest and up-front can a discussion be if the flaws of OA journals are meted out and the same or similar flaws of subscription journals are ignored (such as in the Bohannon article)? This is a good question, and one might as well ask the same thing about the rhetoric coming out of the OA advocacy community, which focuses entirely on the problems with toll-access publishing and ignores problems on the OA side. The answer is the same whether we ask it about OA or about toll access: an honest and up-front discussion requires us to address both the upsides and the downsides of both models. The Bohannon article is one input to that discussion; to my knowledge, no one is arguing that it should constitute the entirety of it. So yes, some money is always ‘taken away’ from research by the publishing process, but that is not limited to open access. Agreed. Again: what we need is a discussion of costs and benefits that acknowledges all costs and benefits of all models. What we have right now in the OA advocacy community is an environment that rewards the discussion of OA’s benefits and the costs of toll-access publishing, and punishes the discussion of OA’s costs and the benefits of toll-access publishing. That detracts from our ability to deal in a rational and constructive way with the real issues and problems our scholars and scientists face. Open communication is in the nature of science. Before the Web, the practical possibilities just weren’t there. Now that the Web is a ubiquitous and stable infrastructure, the possibilities of open access do exist. I agree completely, and I’ll go one step further and say (as I did in my lecture) that in functional terms, open communication is now essentially cost-free. The problem is that science is not only about open communication; it’s also about certifiably scientific information, and certification (unlike conversation) is expensive. The problem with scam OA publishers is that they sell unearned certification, in very much the same way that diploma mills do. By so doing they undermine the integrity of scientific discourse. For that reason they need to be identified and rooted out early — and those who do the rooting out should be thanked, rather than villified, by anyone who is concerned about the integrity of science. OK, I get it. Relevance trumps quality. I actually agree with that. I have never heard a satisfying response to the question what ‘quality’ actually is in a scholarly journal. It seems to be something nebulous and fuzzy that’s primarily in the beholder’s perception. This, of course, is true for any journal, irrespective of its publishing model. What the OA/TA discussion really comes down to is the question of which way of financing the necessary expense of publishing it is that delivers the greatest benefits to science and society at large, at the lowest cost to science and society as a whole. My view is that even as the costs, in the aggregate, should transpire to be the same, the benefits are more than likely to favour OA. Working on trying, without prejudice, to answer this question has led many an OA advocate to their position. Shouldn’t the same apply to those who input criticism of the toll-access model into the discussion? The realisation that it doesn’t consititute the entirety of the discussion? Or should OA advocates, in contrast to Bohannon, always have to balance any downsides they identify of the toll-access model with downsides in the OA model? Some robust discussion is certainly in order. Advocates or apologists of one side pointing out what’s wrong or unsatisfactory in the other side, and vice versa. Maybe I’m reading too much into it, but you make it sound as if toll-access apologists are being unjustly bullied into submission by OA advocates without a right to a riposte. I don’t believe that is the case. I agree. And as I have said above, the question is how that cost is compensated for so that the greatest benefit of publishing for science and society can be achieved. And yes, scam OA publishers/journals are a problem and they ought to be exposed and their practices rooted out. They do undermine the integrity of the scientific discourse and make OA suspect. The only thing I object to is the association of unsavoury practices with OA, whereas they are a generic problem in science publishing per se, irrespective of OA or TA status (though I accept that OA scams may be more visible than TA ones – which is also the good news: they can be exposed more easily). All scam journals are problematic and need to be exposed and their practices rooted out; not just the OA ones. Well, give me concrete examples, one by one, and we’ll discuss them. I will not punish; promise. I will subsequently put to you some concrete examples of problems that arise from TA itself, also for discussion. And I’d like to suggest that you add examples of intrinsic upsides of the TA model to the list of things to discuss as well, if I may. Shouldn’t the same apply to those who input criticism of the toll-access model into the discussion? Yes, of course it should. Maybe I’m reading too much into it, but you make it sound as if toll-access apologists are being unjustly bullied into submission by OA advocates without a right to a riposte. I don’t believe that is the case. The only thing I object to is the association of unsavoury practices with OA, whereas they are a generic problem in science publishing per se. To be clear, I’m not saying that these practices are a natural consequence of OA; I tried to make that clear by saying the opposite, repeatedly, in the lecture. What I am saying is that they’re a natural consequence of the author-pays model, which is a prominent feature of the OA environment. While I agree that it’s important not to associate predatory publishing with OA writ large, it’s also important not to ignore the fact that author-pay models (and the perverse incentives they entail) are a significant feature of the OA landscape. Well, give me concrete examples, one by one, and we’ll discuss them. I provided a bunch of them in my lecture (see above). I will subsequently put to you some concrete examples of problems that arise from TA itself, also for discussion. And I’d like to suggest that you add examples of intrinsic upsides of the TA model to the list of things to discuss as well, if I may. Happy to do it. I am not an advocate for the toll-access model and I see plenty of downsides (as well as upsides) to it. Open Access Journals don’t seem to take full advantage of their key feature. 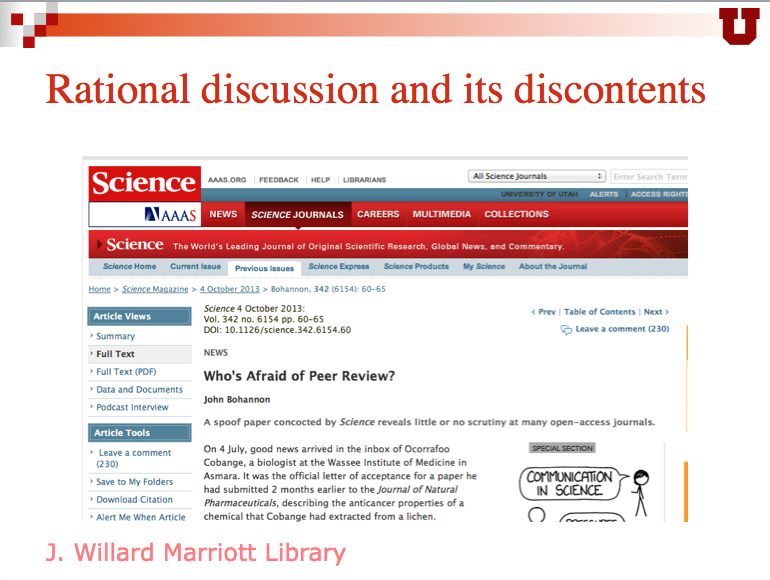 When a researcher is reading an article by his peer, what is it that can make him suffer most? Unavoidable misprints and minor errors are responsible for that. Correcting them is always time-consuming and has a distracting effect on content comprehension. Similarly, on publication of one’s own article one frequently sees in it some minor faults and misprints whose correction would constitute an improvement. Conventional hard copy journals use in such cases a procedure that can be regarded as highly impractical. Even though an appropriate letter may be sent to the editor very soon, it will not be published without much delay, if at all. In any case, the article and the corrigenda will appear in different issues of the journal and thus may not be jointly taken notice of by all readers. On the contrary, an Open Access Journal could see to it that any corrigenda could be accessed in the very file of the article in point. The reader could then be informed of a misprint a moment after it had been noticed. My strong belief is that providing such an option to contributors would improve the impact factors of any Open Access Journal.